FeedbacK Golf app first of three unique sports tech instruction, practice and play applications. FeedbacK™ is a team in Hampton, Virginia of golf professionals, engineers, programmers, and analysts with expert technological knowledge. Using proprietary algorithms and computer vision techniques, the Sports Techie team developed a personalized, adaptive, instant-feedback coaching system. This revolutionary, virtual instructor is available through FeedbacK™ Golf, their flagship product. The new smartphone app is hands free, voice activated and requires no extra hardware, enabling a true capture of driving range videos. Shawn McDonald, Founder, Feedback Enterprise, LLC, spoke to the Sports Techie blog about their new sports business, the upcoming iOS app launch, and the search for investment capital to fund development of two additional FeedbacK™ sports technology products. FeedbacK™ Golf, a smartphone application, collects video of a golfer’s swing at the driving range; analyzes the swing using the FeedbacK™ Intelligent Decision Inference System; and, provides immediate audible coaching instruction to the golfer. “There is a trend of smartphone use on the PGA and LPGA Tours,” said Shawn, who has more than 22 years of business experience that includes business development, information technology leadership, engineering, finance and an entrepreneurial spirit. Shawn shared that professional golfers like to record their swings and putts to help improve their game just like amateurs players do. Using a smartphone to record swings requires lots of editing, hitting and swinging for each swing. Then Sports Techie golfers have to repeat this same process, again and again. FeedbacK™ is the Industry’s first voice activated virtual coach. All a golfer has to do is say, “READY,” and let your smartphone automatically record the best FeedbacK™ swings. Shawn noted that their app was designed for all golfers, from introductory level to the tour professionals, for the lifetime of the app. This innovative instruction app costs the price of two lessons with a real PGA certified instructor. FeedbacK™ provides a lifetime of instruction at a fraction of the cost. FeedbacK™ Golf collects video of a golfer’s swing at the driving range; analyzes the swing using the FeedbacK™ Intelligent Decision Inference System; and, provides immediate audible coaching instruction to the golfer. Use of a Bluetooth Headset compatible with your device is recommended. FeedbacK™ Golf: Collect will be available in the iTunes App Store June 2013 at a price $4.99. The FeedbacK™ Golf: Collect Bundle (bluetooth adapter, and smartphone holder for use on the driving range) will be in retail stores August 2013 with everything a golfer needs to collect smartphone video at the driving range. The FeedbacK™ Golf: Analyze application will launch in Fall 2013 followed by FeedbacK™ Golf: Instruct in January 2014. The FeedbacK™ web site has three pages – World, Golf and Clubhouse. 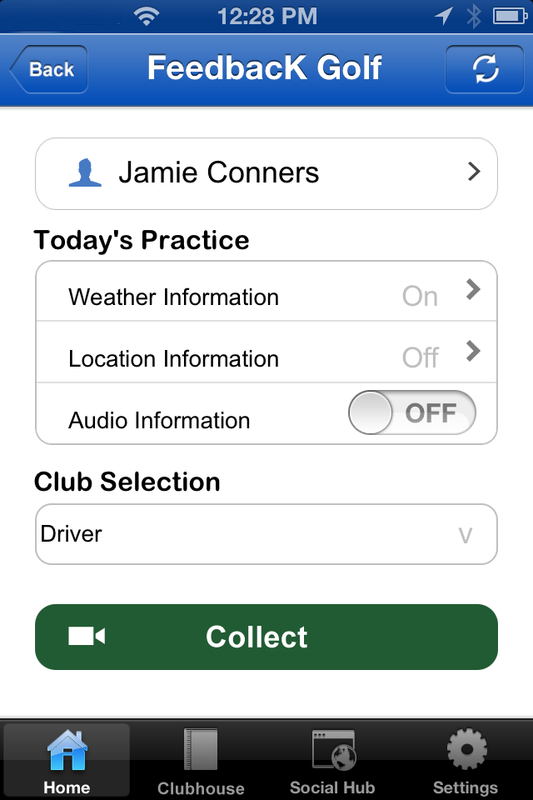 The clean User Interface quickly enables the golfer to set up a profile and begin a practice session. Select from one of four packages – Pro, Pro Plus, Pro Elite, and Pro Eagle, to have your swing reviewed by FeedbacK™ and PGA Pro, Jamie Conners. The package costs range from $29 to $449 a year. The number of swings reviewed per package is 1,6,12, and 18. All of them come loaded with a voice over coaching of your swing video, recommended drills and 10-15 minutes lessons. Pro Elite allows for expedited review in less than 36 hours. Pro Eagle gives you that feature plus 15 minute live review on your phone. Simply upload the video of either a front or down-the-line swing and they will return send you an email with a link to your personal lesson. The web site also has a Pro Shop. Right now you can buy the different FeedbacK™ swing analysis programs. A Sports Techie can easily visualize how the Pro Shop will have other products such as the Bluetooth headset to purchase. Shawn and I talked about the app features through our half hour conversation. I like how the FeedbacK™ app uses a timer that has a 3 second default that can be adjusted. It tags video with location and weather information using GPS. It also records audio info and club selection whenever you collect a video. Side by side video comparison has become a standard tool for golf instruction and learning as have drawing tools. The FeedbacK™ virtual instructor allows for voice notes to be recorded by instructors. FeedbacK™ synchs to the cloud and hosts data in the clouds via smartphone and WIFI to help save download costs and time. Finally, a review by a PGA Pro is a dynamic and proven way to improve performance. The FeedbacK™ Social Hub enables posting to Facebook, Twitter. Send an email of any video with comments to your golf buddies. Show off what you have learned to your social media network with FeedbacK™. The FeedbacK™ Intelligence Decision Inference System is a core component of the proprietary technology. The idea is the software AI will start to learn your game and adapt, getting more intelligent the more you correspond together. Shawn says, “FeedbacK™ inference is where you take a club PGA professional’s knowledge and take him out of the equation.” Right now all video reviews are handled by Jamie but beginning in January, 2014 with the release of FeedbacK™ Golf: Instruct, the inference system will take over and completely automate the process. “Computer vision techniques and FBI facial recognition tech are the same concept,” said Shawn. The computer vision tech detects the head of the club, tracks the path of a club, and calculates swing speed and pace. This FeedbacK™ technology also needs to be built out further. Headquartered in Hampton, VA, FeedbacK Enterprise, LLC. is a software development company that specializes in video analysis utilizing computer vision and intelligent learning system techniques. Feedback™ Enterprise, LLC was established as a single member limited liability company in the Commonwealth of Virginia in 2012. Our principle corporate office is located in Hampton, Virginia. From their office you can see the U.S. Naval ship yard and the boats come in and out, exclaimed Shawn. Shawn spent 20 years as contractor at NASA Langley Research Center. She went to Santa Clara University and earned a Master of Science, Engineering Management. Although she is not a golfer, about a year and a half ago, Shawn was at a driving range and wondered if there was a smartphone app that could help her like a coach would to improve her swing. She Google searched it and found nothing. From this Sports Techie experience, FeedbacK™ was born. Jamie Conners, FeedbacK™ Director of Instruction, is also a PGA Professional Instructor. Jamie has been a member of PGA of America since 1989 and named to the PGA President’s Council. He is also a PGA Ambassador of Golf. He was the Lead Golf Instructor for the past three years with On-The-Tee. Previous to that, Jamie was Director of Golf for seven years at Kiln Creek Golf Club & Resort. He spent five years before that as the Lead Gold Instructor, ESPN Golf School. Jamie has a passion for the game of golf and a passion for people. The rest of the team is: Shady Al-Zubi, Chief Engineer, Jeff Brandt, Developer, Jennifer Adriany, Marketing Strategist, with 20+ years in verbal, print, and electronic Marketing/Business Development communications, and Craig Nurchisor, Business Analyst. I asked Shawn what their Business Analyst does? “Craig manages the supply chain of the bundled ‘box’ of FeedbacK™ products, “ said Shawn. Like many of the startup businesses we feature on Sports Techie, Feedback™ is self-funded and bootstrapped. They are considering crowd funding to raise capital and are looking into Kickstarter and other similar platforms. Shawn is welcome to outside private investment solicitation at this point in the project. Their current funding covers the costs with the first of their three sports tech products. Right now Jamie will provide human FeedBacK, until 2104 when the plan is to, “Take the human out of the loop,” according to Shawn. Competition includes the VGolf app. Shawn mentioned that it is, “inconvenient,” because of how they collect video of a swing using a phone. No voice activation tech in the VGolf app requires a more labor intensive process which also takes away from your focus, practice rhythm and execution. Other sports on the immediate Feedback™ development calendar are tennis and baseball. Pitching and batting biomechanics and the motion of hitting a tennis ball are similar to a golf swing. User feedback will help them decide which one to target first. The logo on the “Collect” web site page has a picture of a plastic adaptor that is used for an LP player in order to hear 45 records play at the slower speed. The upswing is an important part of improving your swing and Shawn laughed when she said that, “45 degrees came up over and over,” with regards to golf instruction and club face angles. She laughed again when saying the Feedback™ 45 concept is actually hard to explain to a class of 25-54 year olds because most the younger ages do not know about 45 records. FeedbacK™ Golf: Collect, their first product to launch, is in beta testing and members of FeedbacK™ will be at the LPGA Kingsmill Championship in Williamsburg, VA from April 29-May 5, 2013 and can provide details to tour or industry professionals interested in participating in their beta tests. http://www.kingsmill.com/LPGA/. For the record, Beta does not refer to the old video format that was replaced by VHS, DVD and Blue Ray. Sports Techie, The FeedbacK™ smartphone app is truly one of a kind because of the audible coaching element. The fact that video collected with FeedbacK™ is not a digital reproduction is also a superior feature. FeedbacK™ collects video of a golfer’s swing at the driving range; analyzes the swing using the FeedbacK™ Intelligent Decision Inference System; and, provides immediate audible coaching instruction to the golfer. Is this Sports Techie or what. FeedbacK™ Golf: Collect will be showcased in a short walking tour on their website FeedbacK-Golf.com beginning May 10th. If you are interested in investing, please email: info@feedback-world.com. Fortunately, I have my own virtual coach in my Sports Techie brother, Ricky Roble. 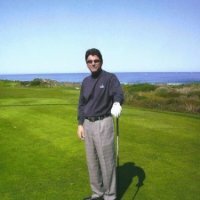 His background managing at a golf course resort, combined with coaching a high school team, and having a former roommate, who was a certified PGA Pro female, gives him the ability to learn my swing, personalize, and adapt while offering improvement and advice, just like the FeedbacK™ Golf app does. Unfortunately, Rick cannot be there every time I golf to instruct me but FeedbacK™ provides a lifetime of instruction at a fraction of the cost on the iPhone beginning June 2013 at the iTunes App Store for the entire Sports Techie global community. French coffee brewers are best for preserving the flavour of it. far from those modern conveniences. invest in something a bit heavier such as copper or stainless cookware. In Asia, it maintains sales and distribution offices in Japan, South Korea, China, Taiwan, Philippines, India and Singapore. that you could possibly need in an amazing cookware set, and are available all kinds of designs, shapes, sizes, and prices. Shopping for a new or used vehicle might be a hard approach unless you know what you really are carrying out. By teaching yourself about vehicle buying prior to deciding to visit the car dealership, you can make stuff simpler for your self. The following tips will help the next purchasing getaway be more satisfying. Generally provide a mechanic together when searching for a brand new motor vehicle. Vehicle dealers are popular for offering lemons and you may not want to be their after that sufferer. Whenever you can not obtain a auto technician to consider cars together with you, at least make certain you have him look at your final selection before you purchase it. Know your boundaries. Before you begin shopping for your upcoming automobile or truck, decide how much you can manage to shell out, and follow it. Don’t neglect to add interest in your estimations. You will probably shell out about 20 % as a payment in advance also, so prepare yourself. Well before seeing a car dealership, know what sort of motor vehicle you need. Investigation each one of you choices ahead of shopping so you can determine what works the best for your financial allowance and household requirements. Shop around to find out just how much you should be paying for the prospective car. Before signing any agreement take time to read each line, such as the fine print. When there is anything at all shown that you just do not comprehend, tend not to signal till you receive an solution that you just recognize. Unsavory salesmen can use a legal contract to put many fees that have been not discussed. In the event you keep the preceding advice at heart the very next time that you just go purchasing a auto, you will end up prone to get a good package. Buying a auto does not have to become frustration. Only use the guidelines using this post and you could receive the automobile you need at the good value. Everything is very open with a clear explanation of the issues. It was definitely informative. Your website is very helpful. Thanks for sharing.